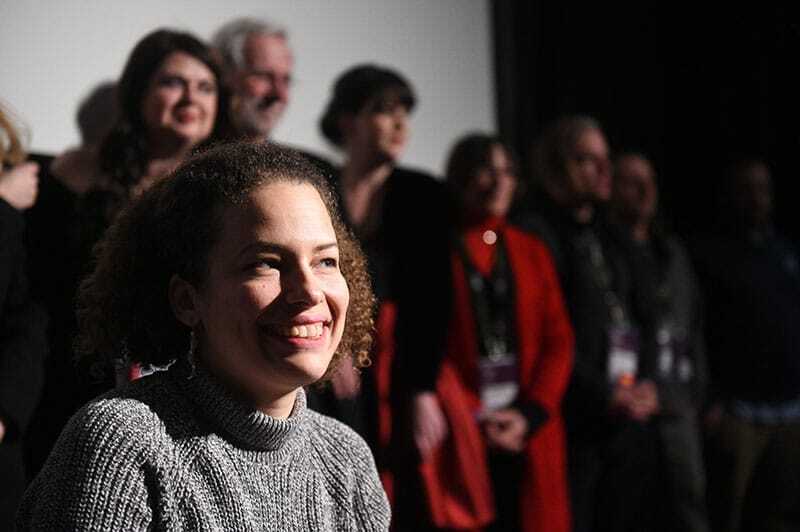 As a filmmaker, but also an ME patient and activist telling the story of a community from the inside, Jennifer Brea knew there was an important place in the world for her film. 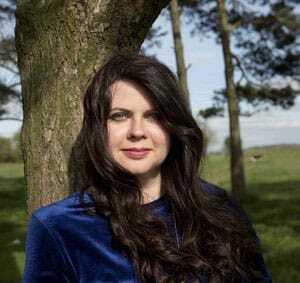 Early in her illness (myalgic encephalomyelitis, also known as CFS or chronic fatigue syndrome), Jen joined an online community of fellow patients in order to build the deep connections that she needed to survive. While documenting her journey, and in dialogue with other people with ME, Jen began working to elevate public awareness of this profoundly complex disease. By capturing her raw personal experience, Jen created a film with artistry, intimacy, and an emotional arc that transcended the medical subject matter, while its themes – love, family, adapting to unexpected circumstances, the power of care and empathy – were universal. From day one, a continuum of support breathes life into the project. In 2013, Jen runs a Kickstarter campaign to fund its production, then named Canary in a Coal Mine, and shortly after receives her first grant, from the Sundance Institute Documentary Film Program. Later she is brought to the 2016 Sundance Film Festival as a Documentary Film Program Fellow along with Unrest producers Lindsey Dryden and Patricia E. Gillespie. Jen also takes part in the editing lab with editor Kim Roberts. Throughout production, the team receives grant and fellowship support from numerous film organizations. ​During late post-production, the film receives substantial support from Impact Partners in the form of equity investment. Once the film is on the brink of wrapping, Jen and producer Alysa Nahmias are invited to Sundance Institute’s Catalyst Forum, which connects culturally-engaged film investors and funders with highly-anticipated film projects. With Catalyst’s goal being to create a culture where investors and filmmakers build fertile partnerships for the long-term, the Unrest team is matched with ​donors and ​investors who could assist with production, finishing​, and impact​ funds​. Equity financing ​amount​s​ to 20% of their total production budget. Unrest's four-year production budget ends up in the high six-figures, which is average for documentaries in the U.S. Documentary Competition section at the Sundance Film Festival, where Unrest premieres in 2017. The budget is financed through grants and crowdfunding (70%) and equity (20%), with a 10% shortfall at the film's completion. This is a typical financing structure for documentary films, with a modest amount of recoupable financing and the remainder non-recoupable. During the Festival, the Unrest sales team, Submarine and Preferred Content, secures a deal with Netflix for global SVOD rights, and with Independent Lens for U.S. broadcast rights, giving the filmakers the ability to exploit other rights like theatrical, semi-theatrical, and TVOD transactional video-on-demand, e.g. iTunes, Google Play, Vimeo prior to the SVOD subscription video-on-demand, e.g. Netflix, Amazon Prime, Hulu and broadcast start dates. In the current distribution landscape, documentaries often find more benefit in splitting up their rights because it gives filmmakers more control over the release of their film and the potential to reach a larger audience. It’s not uncommon for multiple distributors in a given territory to handle different sets of rights, rather than one company controlling all of them. The film's broadcast and SVOD licensing fees cover the equity investment (including 15% premiums A preset amount of net profit that an equity investor receives as interest following recoupment of the principal. ), the outstanding budget gap, and sales agent fees. Documentary film financing often includes the combination of grants and equity. Even though investors put money into documentaries for different reasons, being able to show them as much return as possible contributes to the sustainability of the field. By keeping their equity low and quickly paying back their investors via the SVOD and broadcast licensing fees, the Unrest team allows themselves the freedom to ensure that the distribution and social impact campaigns serve each other in productive ways. Conversations with Sundance Institute’s Creative Distribution team begin at the 2017 Festival. The Unrest team remains confident they have a film that can expand and help lift up a movement, with a passionate film team who can bring their vision to life. And they know that the added support and guidance through the Fellowship will help them maximize their potential and make the biggest social impact. In March 2017, the Unrest team accepts the Creative Distribution Fellowship and sets out to spark social change through the release of their film. The team’s hybrid distribution plan combines goals for both distribution and impact, working together hand in hand. They want to ensure that these two areas operate synergistically in order to fuel their overall campaign. Like many issue-driven documentaries, the aim of Unrest’s release isn’t financially motivated; they are driven by the desire to generate awareness and shift public perception. Filmmakers often keep traditional sales and distribution separate from their impact campaigns because historically distribution is motivated by achieving a financial return, whereas an impact strategy is striving for different outcomes. The Unrest team is confident they can flip this script and use both of these avenues to mobilize audiences. Generate significant media coverage to elevate the public profile of the film and the issue. 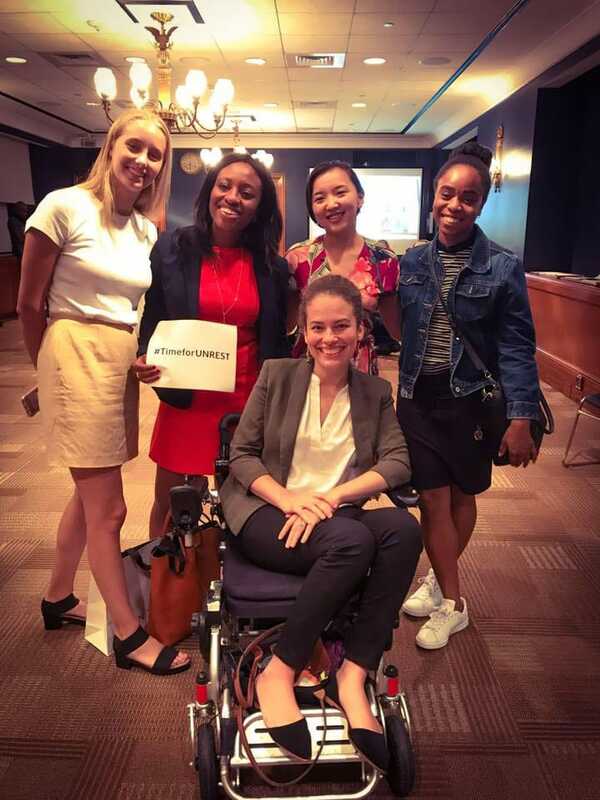 Reach the widest possible audience, including those who aren’t already documentary fans or activists in the ME patient community, while prioritizing connective social experiences, both in-person and virtual, that are inclusive of homebound and disabled audiences. Achieve artistic recognition for Unrest and lasting cultural resonance & longevity. Reach their core audience, the ME/CFS community, to galvanize them and their loved ones in support of the Unrest campaign. Gain mass and strategic recognition of ME as a debilitating illness suffered by millions by reaching wide audiences and bringing them into the conversation. Leverage public screenings, in physical and virtual events, to mobilize a community of ME patients and allies to action. Generate significant media coverage to challenge existing conceptions of the disease. Leverage targeted screenings to promote knowledgeable and empathetic care for ME within the medical profession. Inspire new scientists and funders to join the field. Mobilize patients & allies, and leverage targeted screenings of Unrest to engage elected officials and policymakers for change. Online screenings with Q&As and discussion through ITVS’ OVEE platform (in tandem with theatrical engagements) to allow homebound audiences a virtual, social experience of the film during the traditional theatrical window. During 2016 and 2017, film impact strategist Jessica Edwards works extensively with Jen and producer Lindsey to map the landscape of ME in the United States and United Kingdom. This work builds networks and partnerships that are activated during distribution. Because of this preemptive network-building and Jen having spent years interacting with her community and building relationships, the Unrest team has a head start in finding their core audience. By the time Sundance Institute’s Creative Distribution team begins working with the Unrest team in March 2017, they already have 14,000 active, engaged followers on Facebook and are able to identify their diverse range of personal connections to the global ME community. As Jen states, “These are communities distributors never think of as audience.” This preliminary audience-mapping makes it easier for the Unrest team to determine their multi-pronged strategy for getting the film in front of their core audience and future fans. Who will watch the film? The Unrest team pursues both a theatrical and semi-theatrical release to amplify the film’s message throughout the U.S., as well as the UK, because of its role in the film and large ME patient/activist community. To release theatrically in the U.S., the team hires Michael Tuckman, founder of mTuckman media, a well-known theatrical booker who has experience working on self-released titles. To release semi-theatrically, they enlist Film Sprout, a distribution consultancy who helps social-issue filmmakers create robust semi-theatrical screening campaigns. To release theatrically and semi-theatrically in the UK, the team hires Together Films, an impact distribution consultancy focusing on hybrid distribution models. In May 2015, Jen co-founds a non-profit called #MEAction, a global grassroots advocacy network for people with ME. She wants to create a short-term campaign for the film’s release for immediate impact that also supports the longer-run, community organizing strategy of the non-profit. With that goal in mind, through her production company Shella Films, Jen hires an impact team and general operations team to manage all aspects of the distribution and impact campaign. To cultivate meaningful press opportunities, the Unrest team employs PR firms in four main markets to find and manage press engagements: Dish Communications in Los Angeles; JMP Verdant in New York; Larsen Associates in San Francisco; and Sarah Harvey PR and Senso Communications in the UK. In order to cultivate opportunities that work to change public perception surrounding ME, the Unrest team brings on consultants that specialize in medical and scientific press outlets, in addition to more traditional PR. Unrest’s 14,000+ social media following makes this film a great candidate for digital marketing. For their digital marketing strategy and deployment, Unrest works with 3rd Impression (also known as 3i, a data-driven digital marketing agency). Their work includes managing social media accounts, social media asset creation, and ad creation and management. The Unrest team collaborates closely with the Creative Distribution team and their consultants to identify the best release avenues and timing that will help them achieve their goals. In order to generate significant media coverage, reach the widest possible audience, and provide an array of different viewing options for their community, they believe windowing their release will be more effective than releasing day-and-date (on transactional digital platforms and theatrically at the same time). Carving out condensed windows for their theatrical, semi-theatrical, and digital releases allows them to create unique opportunities for each branch of their distribution campaign. As mentioned earlier, Unrest comes to the Sundance Institute’s Creative Distribution Fellowship with a global SVOD deal through Netflix and a broadcast deal through Independent Lens already in place. Netflix and other SVOD outlets typically offer two different types of deals for documentary features: one that buys out all rights and another that only acquires SVOD rights, like Unrest’s offer, which allows filmmakers to exploit all other rights. SVOD and broadcast rights are often the most advantageous for documentary filmmakers to exploit. As their sales agent, Josh Braun from Submarine, explains, “Being able to offer all rights to distributors is the peak of the value, but within the broad set of rights, SVOD and/or broadcast rights are probably the most valuable and represent the rights that are most sought after within the current environment.” Since the global SVOD deal surfaced around the same time as the broadcast deal, the sales team ensures the SVOD deal allows for a broadcast window and vice versa. In addition, since both of these start dates are slated for early 2018, the Unrest team carves out a six-month semi-theatrical screenings window as well as a modest theatrical window and a TVOD window before their 2018 live dates. In order to maximize all windowing opportunities, Unrest plans for a condensed, two-and-a-half week theatrical run in key U.S. and UK markets. These markets are determined by three key factors: cities that will generate the most press buzz and attract key influencers for both distribution and impact; those places with the largest potential audiences; and those that are necessary to qualify for the Academy Awards and BAFTAs. In order to qualify for the Academy Awards, films must have week-long theatrical runs in both New York and Los Angeles, which must be advertised in specific publications and have a film review in either The New York Times and/or the Los Angeles Times. For BAFTA qualification, a film must have a theatrical release on at least ten commercial screens in the UK, running for a minimum of seven days. Community screenings or semi-theatrical screenings, which allow for organizations and communities to screen the film in a non-theatrical space for a small license fee, are a large part of impact campaigns and an important screening format and revenue generator for documentary films. Both Film Sprout and Together Films have worked on numerous impact campaigns, including the successful outreach effort for The Hunting Ground, and have a deep understanding of how semi-theatrical releases can be the best alternative or supplement to theatrical distribution for documentary films in terms of reach and cost effectiveness. The Unrest team plans to carry out community screenings with partner organizations and the ME patient community all across the U.S., UK and Australia. Beyond community screenings, they also know they will need to create ways their homebound audience can experience the film with their friends and family. Another crucial element of their impact campaign is creating experiences where people can gain a deeper understanding of what it’s like living with ME. Jen creates a virtual reality piece with Agat Films, Ex Nihilo, and Little by Little Films that mirrors her experience of living with ME, and during their strategic planning, the Unrest team explores ways they can pair this experience with screenings of the film. In order to provide multiple viewing opportunities for their community leading up to their anticipated SVOD and broadcast 2018 live dates, the team makes the film available for TVOD shortly after their theatrical premiere, but with enough time to carry out exclusive, in-person screening events during their theatrical release window that aim to generate discussion and build community. As Jen explains, “For me, having a clean theatrical window was about creating really powerful, in-person events. It's the most impactful way to view a film like this – in community with others.” As far as TVOD platforms, they release on iTunes, Google Play, and Vudu through Sundance Institute’s digital partnership with Quiver, and directly upload the film to Amazon Video Direct and Vimeo. Through Quiver, they also released on InDemand for cable outlets and DirecTV for satellite. In order to support their expansive release goals, the team initially puts together a low-to-mid six-figure impact/distribution budget, which is based off consultant fees and their associated costs, paid print and digital ads, trailer edit, poster design, printing and travel costs, and producers and in-house distribution team fees. Their distribution and impact campaign needs and their producer and in-house distribution team fees are primarily covered by the $100,000 grant provided by Sundance Institute, a Kickstarter campaign from August 2017 (through which they raised $160,000), and their total net revenue, which we’ll later see amounts to $220,835. Their total impact/distribution budget is $493,612 (The Unrest team is currently $12,777 in the red). In order to resonate with a broad audience, the Unrest team focuses on three main areas for branding the film: the medical mystery of ME; Jen as a character in the film; and Jen and Omar’s love story. 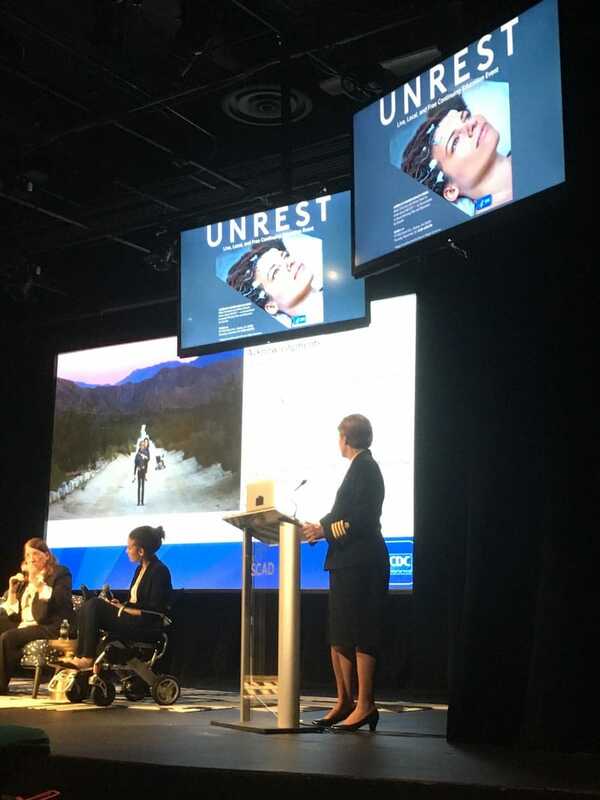 One significant and strategic asset that becomes central to their branding is their key image: Jen connected to an EEG machine. The picture captures the medical mystery and evokes Jen’s emotional and physical journey. Rather than use an original photo, which was not print-resolution, they enlist photographer Jason Frank Rothenberg to recreate the scene –– it results in their main image, appearing on their poster, and all of their materials throughout the release. After their Sundance premiere, they conduct another photoshoot with Jen and her husband Omar in the California desert in order to generate more assets that speak to the central love story. Platforms such as iTunes and Netflix require multiple high-quality marketing assets, so it is important to create as many assets as possible going into their release. The Unrest team works with Jeremy Workman and his team at Wheelhouse Creative to edit a theatrical trailer for Unrest during the summer before their theatrical release. The whole process takes a few weeks. After an initial creative phone call with Jen, Wheelhouse creates a rough cut of the trailer. Jen and the Unrest team provide detailed notes on the rough cut and each subsequent iteration of the trailer, which are quickly turned around for review by Wheelhouse. They use music from the Unrest original score by Bear McCreary, as well as a licensed track by musician Ren Gill, who appears in the film and is a UK-based ME patient and advocate. The team also works with their clearance counsel Lisa Callif at Donaldson & Callif to advise on the inclusion of archival and fair use materials in the trailer. Wheelhouse creates graphics with festival laurels and pull-quotes from positive press garnered on the festival circuit. With a finished trailer in hand, the Unrest team works with their press team and Sundance Institute to secure an exclusive release in order to generate buzz. They pitch Apple Trailers (over other outlets such as Indiewire) because Apple has a wider reach and more promotional opportunities. The Apple Trailers release is slated for July 24th, 2017, roughly two months before their theatrical release date. After the key domestic markets are identified, Michael Tuckman helps the team map out the best timing for the release, working backwards from their January 15th, 2018, Netflix live date, which was mandated in their Sundance Film Festival deal. They set week-long runs in their target domestic cities: New York, Los Angeles, San Francisco, Chicago, and Berkeley. New York is one of the most competitive markets to book, so when the Unrest team is offered a September slot at the IFC Center six months out, they know it is their best option. Unrest premieres at the IFC Center in New York on September 22nd, 2017, and rolls out to the additional cities the following week. Michael Tuckman and their PR teams also advise them to hold as many press and influencer screenings as possible in New York and Los Angeles, and for Jen to attend screenings in each theatrical market, because screenings with the director or talent in attendance are known to draw bigger crowds. In addition to this two-and-a-half week theatrical run in key markets, Unrest continues to screen at festivals around the world and at an additional 24 one-off theatrical screenings in cities where there is a large fan base. With UK subjects in the film and Facebook analytics determining that there’s a robust ME community in that region, the Unrest team also implements a UK theatrical run. In concert with Together Films, publicists Sarah Harvey PR and Senso Communications, and VR tour team Virtual Umbrella — supported by a BFI National Lottery Audience Award, which Together Films received September 2017 — Unrest has a robust UK theatrical release along with a tour of the Unrest VR experience at all of Britain’s major indie film venues, including Picturehouses, BFI Southbank, Curzon Cinemas, and BerthaDocHouse. They initially plan for a two-week run, but are held over for longer than the specified two weeks. They also expand into additional cities due to high demand, ultimately playing at 40+ theatrical venues in the UK to date. These theatrical screenings are often accompanied by special Q&As with Jen, producer Lindsey Dryden, and/or expert speakers from the medical and patient communities (following robust grassroots outreach). The Q&As are an important part of the audience engagement strategy and take place at the majority of British theatrical events. Community screenings with partnering organizations and the ME patient community are carried out across the U.S., UK, and Australia. At a number of Los Angeles theatrical screenings and multiple UK theatrical locations, they also screen the VR piece to give audiences a deeper understanding of what it feels like to live with ME. 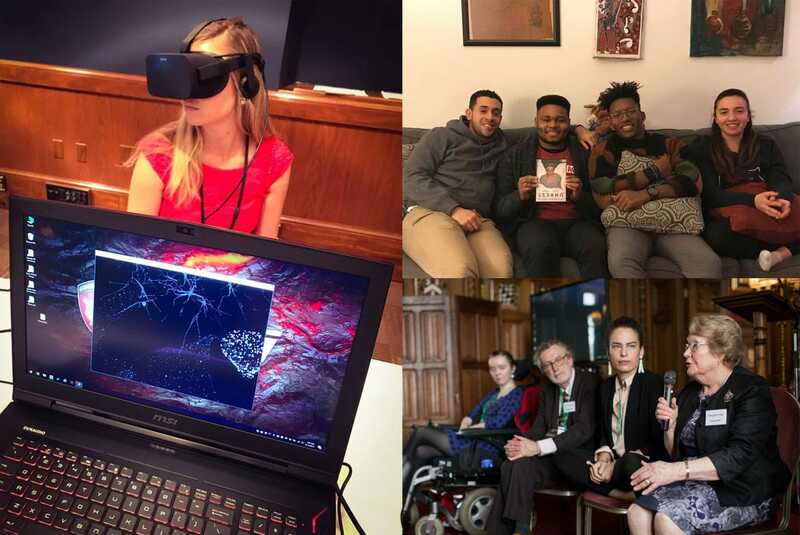 On September 13th, 2017, a week before their New York theatrical premiere, they present the VR experience for staffers and members of the appropriations committee on Capitol Hill with the help of New Jersey Senator Cory Booker and Massachusetts Senator Ed Markey. They also partner with the Centers for Disease Control on an educational event, which includes a presentation of the film for medical professionals. In the UK, they arrange a screening event for Parliament to encourage legislative change, as well as a screening at the Royal Society for scientists and medics. Additionally, Executive Producer Ruth Ann Harnisch expands the reach of the film by donating theatrical tickets for medical practitioners, and Shark Island Productions supports and manages an entire impact screening campaign throughout Australia. Another integral part of the impact campaign is to provide viewing opportunities for Unrest’s disabled and homebound audience. The team works with their broadcast funder, ITVS, to hold OVEE screenings during a select few U.S. & UK theatrical events, as well as an exclusive virtual premiere for Kickstarter backers. OVEE screenings allow for a specified number of people to tune in to a theatrical event while it’s happening and participate in virtual post-screening discussions. They also work to mobilize their patient community during their broadcast and streaming events through the creation and promotion of a house party program, which encourages people to come together and watch the film during one of the specified streaming dates and take various actions, which include calling the NIH (National Institutes of Health), signing petitions, making donations and joining ME organizations such as MEAction, SMCI (Solve ME/CFS Initiative) and OMF (Open Medicine Foundation). The Unrest team begins their digital TVOD pre-sales on iTunes on September 5, making premium pre-sales available worldwide slightly before their theatrical release at the relatively high consumer price point of $14.99. Because of certain SVOD contractual obligations, they must list their TVOD sales at premium pricing and are unable to offer rental until a month before their SVOD live date. 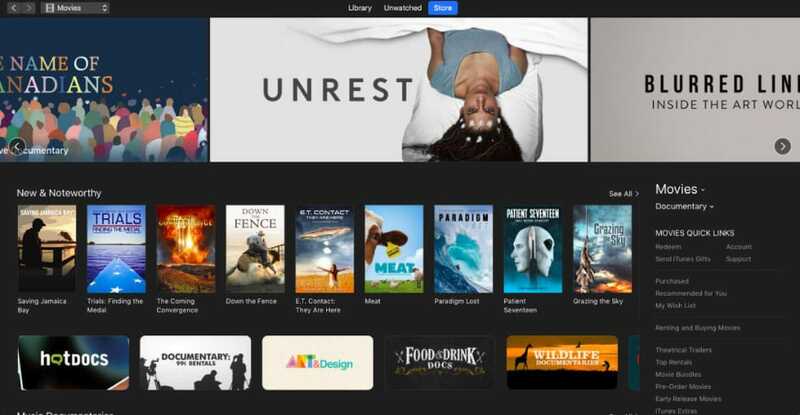 Pre-sales on iTunes are an important strategy for independent documentary films, because if a film performs well during this phase it’s likely to chart in the iTunes store, giving it even more visibility among new audiences. On October 10, two and a half weeks after their theatrical release, they start EST (electronic sell-through) sales for U.S. and Canada on iTunes, Vudu, and Google Play. The film becomes available for worldwide EST soon afterward on October 31, after which it reaches the top 10 for documentary releases in the U.S. and UK stores and number one in smaller stores such as Australia and Norway. The Unrest team could have made rental available at the same time purchase was available if they had decided to release day and date; however, they believe this would have cannibalized their ability to maximize theatrical and non-theatrical audiences and garner meaningful press opportunities. The Unrest PR teams also help organize and promote press, Academy, and influencer screenings, such as small invite-only events at Crosby Street and Dolby in New York, Delancey Street in San Francisco a week before the domestic theatrical premiere, and in London a week before the UK theatrical release. Total PR spend comes to $48,335, which includes consultant fees, print ads, PR travel, and press screenings. To maximize audience growth and reach, it’s imperative that independent films find and engage with their audience on social media. Efficient and cost-effective, social media advertising can help film teams identify target audiences, reach large groups of potential fans, and refine marketing materials by monitoring how people react to them. During the planning phase, Matt Delman, senior strategist of 3i, maps out a digital marketing strategy with the Unrest team that connects with each phase of their distribution, impact strategy, and windowing. With a digital marketing ad budget of $35,000, the team focuses on three campaign objectives: awareness (pulling in new fans), validation (circulating positive press surrounding the film and its cause), and conversion (encouraging people to carry out a purchase or action). Starting out, 3i promotes the theatrical trailer to test initial audience buckets—the ME community, medical practitioners, related diseases, alternative medicine, documentary fans, women’s rights groups, the disability community, and caregivers—and observes which ones have the highest engagement. The Unrest team also sees this trailer promotion contributing to their impact campaign by introducing broad audiences online to the experience of ME. When they first run trailer promotion ads, the core audience (fans who already liked and engaged with the page) has the highest rate of engagement with the content. In order to pull in new fans, 3i crafts a series of 30-second spots tailored to each audience that run as “dark posts”—meaning they are not seen by the Unrest feed, but only new audiences. This significantly helps increase engagement with new audiences, as indicated by a higher PSR (per share ratio), which means more people are sharing the content, and lower CPMs (cost per thousand impressions). This strategy also helps identify the most responsive users, such as medical practitioners, and eliminate two of the eight audience groups, the women’s rights and disability groups, optimizing out the lowest engaging 25% of users. Matt hypothesizes that the work doesn’t resonate with women’s rights groups because the idea of gender bias in medicine isn’t prominent enough in the trailer. And while the team thought disability groups would relate to Jen’s story of being bed-ridden, that more general audience doesn’t necessarily relate to the specific topic of chronic illness. For the New York City premiere and theatrical release, 3i uses a 20-second spot highlighting the themes of caregiving in the film. They first post this organically, meaning not through a paid ad, and then boost to people within the identified audiences that fall within 25 miles of New York City. These ads reach over 300,000 unique New Yorkers and result in over 12,000 clicks at a $0.32 CPC, or cost per click. For the iTunes release, 3i implements promotions for presales but focuses most of their efforts on when the film is available to watch on the platform. During this promotion, 3i ties a version of the trailer with added review quotes to ads that encourage click-throughs to iTunes. 3i spends a total of $7,884 on the iTunes campaign, which results in over 18,000 clicks at a $0.43 CPC. 3i also works on the promotion of the Unrest impact-funding Kickstarter campaign, which yields the highest ROI of all ad campaigns. According to Matt, this sort of direct response campaign is successful because it asks people to take action and donate immediately, instead of planning a night out at the theater. All together, the Unrest team spends $31,137 on digital marketing ads: $23,617 on Facebook, $3,853 on Instagram, and $3,667 on Twitter. 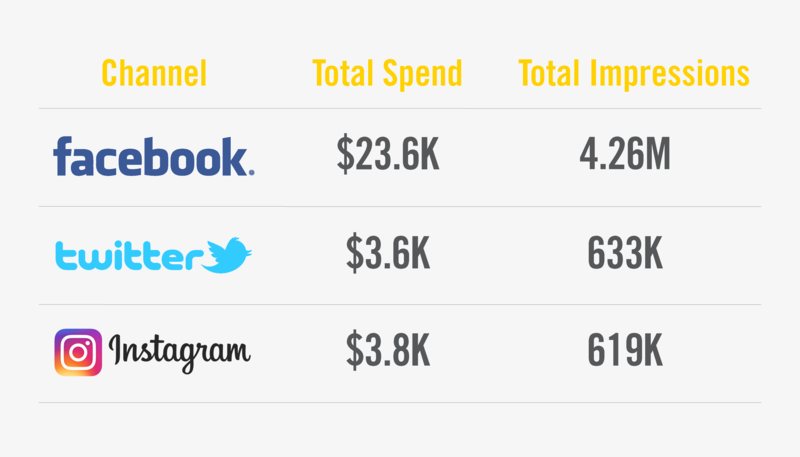 Facebook is the largest target of spend because it houses the biggest following and is by far the cheapest platform for advertising. With more sharing happening on Facebook, the site also allows for better organic reach. Unrest receives special promotion on TVOD platforms including iTunes jumbotron placement during the TVOD launch, when the film is available for rental December 15, 2017, and during the 2018 Sundance Film Festival, when Unrest is featured in a $0.99 rental promotional area for select titles from the previous year’s Festival. Sundance Institute also promotes the film through its social media channels and newsletters at all of the key release milestones. The Institute crafts an interview between Jen and Oscar winner and Sundance alum Laura Poitras that is featured on Sundance Institute’s website and social media channels. The Unrest team also has numerous patient volunteers around the world who help distribute postcards, send emails to potential viewers, and participate actively in Facebook groups to support the film's release and impact actions. Powster, an advanced ticketing platform, provides in-kind services for the theatrical release, collaborating with the Unrest team to build the ticketing portion of the film’s website, which uses geolocation to populate the screenings that users see. The page automatically updates with theatrical screenings as they are confirmed, and Powster’s in-house team incorporates semi-theatrical events in the listing manually, in addition to helping identify and denote ADA-accessible theaters. Powster also provides the Unrest team with an analytics dashboard to see where users are coming from and how they are interacting with the page. Unrest received substantial press in its four major markets. As of May 2018, Unrest received over 300 pieces of media coverage. “This was crucially important for the impact side of things,” Jen explains. In the U.S., the PR teams at Dish Communications, JMP Verdant, and Larsen and Associates did substantial outreach across major markets with great results. Unrest garnered reviews and feature coverage in the New York Times, LA Times, San Francisco Chronicle, Chicago Tribune, Washington Post, Refinery 29, and many local and national NPR shows. Jennifer and Omar’s previous contacts in the media also helped them secure a coveted slot on The Today Show with Megyn Kelly and a piece in Cosmopolitan. In the UK, Sarah Harvey PR worked with the team to generate coverage across all the major newspapers and radio and television channels, including the Times, Telegraph, Guardian, Express, Daily Mail, BBC Radio 4, and high-impact slots on BBC Breakfast, ITV News, and Channel 5 News. Dish Communications was the Unrest awards publicist, consulting on awards qualification requirements, strategy, and outreach. Unrest landed a spot on the short list for best documentary at the Academy Awards. The film received additional coverage around the short list and PBS broadcast, including the Wall Street Journal profile and an essay in Vogue. Could this documentary change the way we perceive chronic fatigue syndrome? In its opening weekend at the IFC Center in New York, Unrest grossed $10,607, roughly 25% of their final domestic theatrical gross. Unrest was released in nine domestic theatrical markets and grossed $40,081 at the U.S. theatrical box office. The planned domestic theatrical campaign ran for three weeks. However, one-off screenings were still happening across the country as of May 2018. The management of these one-off theatrical screenings was taken over by the Unrest team, which have come to a total of 24 single theatrical engagements. The film also screened at 54 festivals around the world throughout the release campaign, generating $5,000 in screening fees and bringing the film to thousands of additional viewers in a communal setting. As their domestic theatrical booker Michael Tuckman indicates, screenings with Jen in attendance accounted for around half of each market’s weekend box office. Four of these specific instances are charted below. In hindsight, the team felt they would have had stronger attendance and the ability to expand into more markets if they had proactively pitched markets the summer leading up to their theatrical release and throughout their window of garnered press and had applied more grassroots strategies, such as subsidizing theatrical tickets for target audiences or calling key influencers in theatrical markets to build awareness. Unrest was released in the United Kingdom on October 20, 2017. Following a two-week UK-wide tour with special Q&As, the film played at over 100 one-off screenings in independent UK cinemas across 50 locations. The UK reported gross to date is £33,308 ($45,151) at the box office, with Q&A events accounting for 60% of the revenue. Bookings are scheduled up to May 2018, and UK distribution partners Together Films are predicting a minimum £35,000 ($49,500) total gross, which would surpass the U.S. total. This is significant when considering that the UK’s population is one fifth that of the U.S. The team achieved greater market saturation in the UK, which led to broader awareness and more opportunities for public conversation. 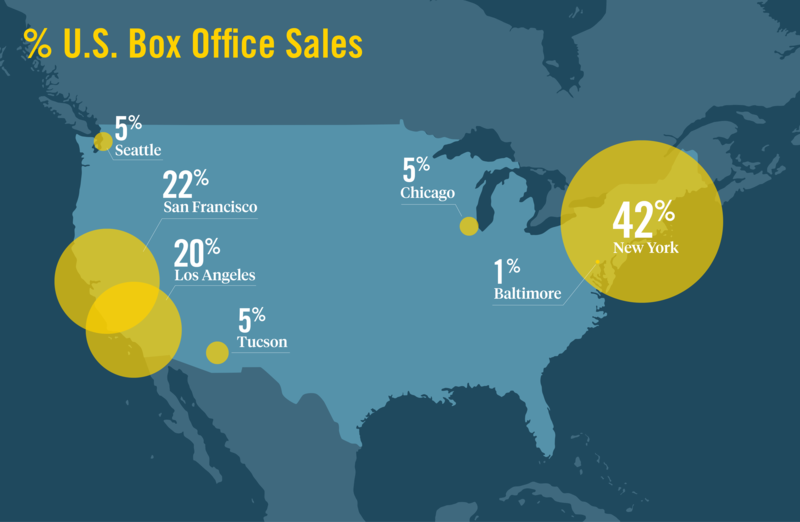 As shown, the U.S. and UK theatrical campaigns were handled differently: the U.S. focused on longer runs in select cities while the UK focused on one-off theatrical screenings with extensive grassroots outreach as well as traditional press/PR. In hindsight, the Unrest team felt that in addition to designated weeklong runs in a select few markets, targeting more one-off screening engagements or weekend runs in the U.S. would have allowed for greater impact and reach, as indicated with the success of the UK campaign. 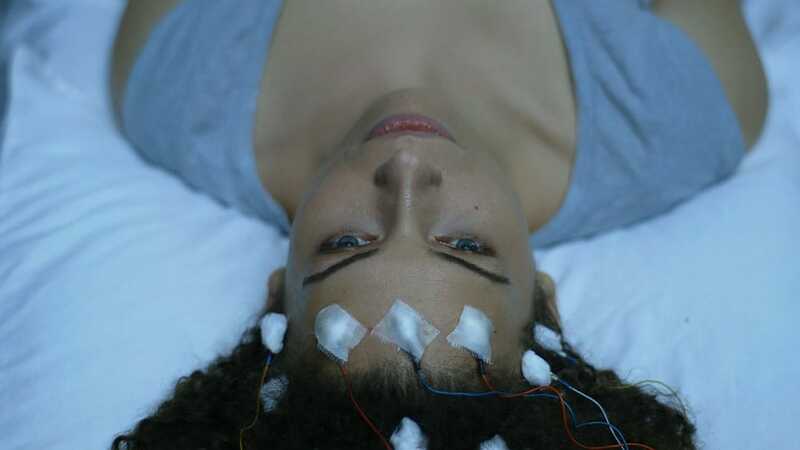 In contrast to the U.S., the UK had the benefit of Together Films presenting Unrest at the Distributor Slate Day in London (an event designed to encourage collaboration between exhibitors and distributors) a month before release to engage the vibrant independent exhibition sector. This allowed the campaign to expand quickly into additional markets. Also, the ease of digital delivery, as opposed to physical DCP delivery for most U.S. theaters, increased the efficiency of the UK theatrical campaign. 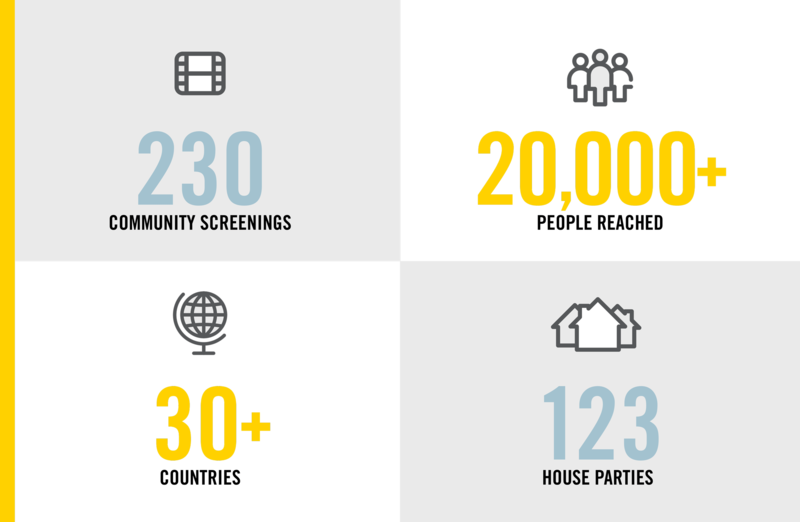 The impact campaign was one of the most expansive elements of the Unrest release, with 230 community screenings in over 30 countries that reached more than 20,000 people. Through license fees from these events, the Unrest team made $38,170 in revenue. Because ME has a background of stigma and insufficient research funding, the Unrest team felt it was crucial to deploy an impact strategy that could help mobilize ME communities and spur meaningful change. With events that encouraged legislatures to revisit their current ME policies, a CDC event that gave practitioners educational credits, and community screenings across the globe that helped communities understand what it’s like to live with ME, they felt the campaign achieved these goals. However, it’s important to note that impact campaigns often outlast the core distribution arc. The Unrest team will continue to encourage engagement through community screenings, educational efforts, and their partnerships with #MEAction and other ME charities around the world. Through their Independent Lens broadcast deal, the film has had 1,502 broadcasts and has reached over 1.3 million viewers. Out of all of the TVOD platforms, iTunes saw the highest gross to date, which could be attributed to the prime promotional placement Unrest received through the platform and the team’s prioritizing of iTunes in their digital marketing strategy. They received three promotional spots and hit the documentary feature top 10 chart each time. As noted earlier, Unrest's global SVOD deal placed restrictions on their TVOD release strategy. In line with contractual obligations and industry standards, the team first launched pre-orders at premium pricing of $14.99 from September 5 through October 10 during their theatrical campaign. They then launched sales at the same premium pricing in the U.S. and Canada on October 10 and worldwide October 31, followed by worldwide rentals December 15 at the non-premium price of $4.99 (i.e., one month before their SVOD live date). Rather than waiting to start TVOD sales when they could list the film at regular pricing, the team felt it was important to offer this option as soon as they could to give members of their community who couldn’t physically attend a screening a chance to watch the film. Once rental was available, they were able to drop the purchase price to $9.99. Listing the film at the initial premium price likely affected the number of sales the film received during the TVOD release, as the overall gross TVOD sales as of May 2018 hover around $140,000, much lower than expected compared to the number of invested fans. However, some of these devoted fans received a digital copy of the film as a reward through the Unrest Kickstarter campaign. The Unrest team’s net share from these gross sales is currently around $86,000, with over 50% coming from iTunes, which also offers a more favorable split to the rights holder—roughly 70%, compared to Amazon Video Direct, which is a 50/50 split. Even though the team didn’t promote the pre-sales heavily, the film received 874 pre-sales on iTunes, a majority of which came from Jen’s initial following. Additionally, the delay between releasing domestically and worldwide caused a piracy spike in regions where the film wasn’t available yet, which also likely contributed to lower-than-expected TVOD sales. The Unrest team initially wanted to aim for the same TVOD release date worldwide, but because their UK theatrical premiere needed to be timed for dates that Jen could attend and was thus later than the U.S. release, they had to hold back releasing on TVOD outside the U.S. and Canada. Fifty percent of their TVOD sales came from the U.S. and 17 percent came from the UK, which is significant to note since their fan base is approximately the same in the UK and the U.S. The team feels the lower TVOD sales in the UK directly relate to the delayed UK TVOD release. Like most independent releases, the majority of Unrest's TVOD sales happened within the first month of the digital release. The Unrest team was involved with the release of the film for over a year. The film reached over 17 countries and over 1.4 million people, and it continues to screen around the world as of May 2018. The team plans to expand their DVD and Blu-ray distribution with the addition of 22 languages and will keep TVOD sales active. As of May 2018, Unrest earned $220,835 in non-SVOD/non-broadcast revenue from self-distribution: $13,294 in domestic theatrical net revenue, $17,568 in UK theatrical net revenue, $38,170 in semi-theatrical/community screening revenue, $86,538 in TVOD net revenue, $5,000 from festival screening fees, and $60,265 in DVD and Blu-ray gross revenue through the Unrest website. They spent a total of $493,612 on their impact/distribution budget, which was subsidized by the Sundance Institute grant, the second Kickstarter campaign, and the total revenue. As with many social issue documentaries today, Unrest's release was an impact-driven endeavor. Eventually, the film will likely break even due to the continuation of DVD, Blu-ray, and TVOD sales. Unrest maximized multiple revenue streams, reached audiences worldwide, and continues to inspire communities around the globe to take action. But this hybrid release was no easy task. It was made possible by a committed team and took a lot of time and resources. Though ultimately deemed successful in meeting their distribution and impact goals, there may have been different strategies they could have deployed that would have made a bigger impact, such as applying grassroots strategy and outreach to a longer window of one-off engagements during the height of their press and national attention for their U.S. theatrical campaign, and a worldwide TVOD release date would have potentially maximized revenue and minimized piracy. For their digital marketing campaign, it may have been more impactful to deploy their trailer closer to their theatrical release date, rather than two months prior, when there was a clear call to action to go see the film in theaters. The Unrest team’s commitment to creative distribution and willingness to experiment along the way armed them with an in-depth understanding of independent documentary film distribution. Below are some key learnings and takeaways. Test your marketing assets (stills, trailer, videos) and messaging to see what resonates with your audience. If you’re confirming deals at different stages of your release, make sure your whole team understands how the windowing and holdbacks associated with certain deals can affect other areas of your release. For a social impact documentary, it might be more beneficial to apply grassroots strategies to your theatrical release rather than focus on more traditional theatrical release strategies. Don’t silo impact and distribution; they work best in collaboration with one another. Make sure your entire team has opportunities to check in with each other, because the strategy one teammate plans to execute might affect other areas of the release. When thinking of self-distributing, talk to your potential distribution collaborators as early as possible, even in advance of your first festival premiere; have conversations about the ways you want to work together and how your various distribution streams could align. When making sales and distribution decisions at a film festival, don't underestimate the value of having a veteran executive producer or producer with sales experience in the room with you (or at least available via phone). Agents and attorneys have their own priorities, but producers/EPs will help you understand the big picture of windowing, budgeting, and strategizing a release from a filmmaker's point of view. Think about your windowing and how that might have an effect on the piracy rate of your film. And if you anticipate piracy could be an issue, consider hiring a takedown service! Traditional distributors can have hidden advantages. For example, when booking theaters, a big distributor is likely to get priority when allocating significant dates or screen sizes because they have prior relationships and clout. And they often invest a massive amount of money in film awards campaigns. If you think your film is an award contender, factor in the award investment that a distributor could make into your film when you make your sales choices and opt to self-distribute or not. There are some things you’ll wish you knew before, but even with that information you may still make the same decisions. For example, knowing that your film will appear on Netflix during the run-up to awards season may help its chances of nominations, but if that would preclude your TV broadcast deal, then you still wouldn’t make that choice. Self-distribution is not for every film or every filmmaker. Be honest with yourself about how you want to spend the next 6–18 months of your professional life. It does help ticket sales to hold panels with audience members from the local community and have cast and/or filmmakers attend screenings. Turning screenings into events is crucial for audience turnout. Engage and mobilize your base. These are your evangelists. Understand which phase of rollout they are likely to engage in. Build out from there to wider concentric circles as your distribution moment changes, and engage your growing audience to help reach new people. People want to consume a film in different ways. Maximizing sales and engagement means reaching everyone how they want to be reached. Even though some teammates were skeptical about DVD, that is still how many people want to consume films, and those are different from show up in theater people, iTunes people, Amazon people, streaming people, PBS people. This is why you want to be on as many platforms as possible. Also understand that this principle applies to marketing—the people most likely to engage frequently on Facebook (and see your advertising) are more likely to be “iTunes people” than “show-up-in-the-theater” people. The latter might be more likely to listen to the radio or read newspapers. Get specific about your audience, how to market to them, and which version of your product they want to use. Jennifer Brea is an independent documentary filmmaker based in Los Angeles and the founder and director of Shella Films. She has an AB from Princeton University and was a PhD student at Harvard until a sudden illness left her bedridden. In the aftermath, she rediscovered her first love, film. She is a Sundance Fellow and has been supported by the Sundance Edit & Story Lab, Sundance Catalyst Forum, IFP's Filmmaker Lab, and the Fledgling Lab. Lindsey Dryden is an award-winning director and creative producer as well as the founder of Little By Little Films, which focuses on projects led by LGBTQ people, women, and people with unconventional experiences of the body. She produced the Sundance award-winning Unrest, Little Ones (nominated for Best Producer, Underwire), and an upcoming vérité series with the ACLU. 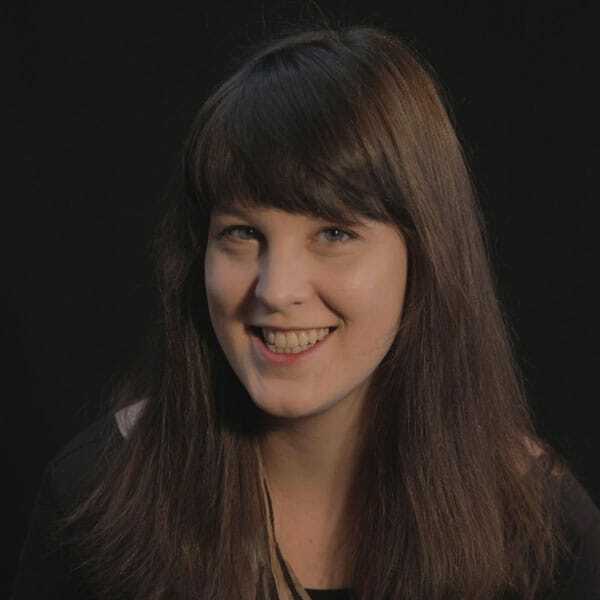 Her directing credits include Lost and Sound (SXSW, nominated for the Sheffield Doc/Fest’s Best Female-Directed Film and OpenCityDocs Best New UK Filmmaker) and Close Your Eyes And Look At Me (True/False). 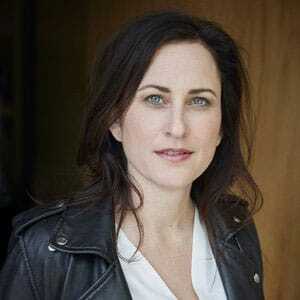 She is a frequent mentor, story consultant, and guest speaker; a fellow of Sundance Institute’s Documentary Film Program, IFP, and HotDocs Forum; and a Jacob Burns Filmmaker-In-Residence. One of the earliest to join Unrest, her passion for creative distribution began when she was an impact producer early in her career. 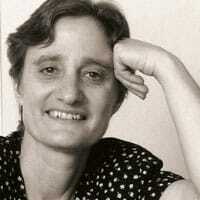 Patricia E. Gillespie is an award-winning documentary filmmaker and Sundance Fellow. In addition to producing Unrest, she served as line producer on Sabaah Folyan's Whose Streets? and is currently in production on her directorial debut, American Monster, a nonfiction series exploring the intersection of poverty and violence in the American South for Viceland. In her spare time, she produces commercial content for clients like Johnnie Walker, Nike, and Adidas. Alysa Nahmias is an award-winning director and producer of nonfiction and narrative films. Her documentary Unfinished Spaces won a 2012 Independent Spirit Award and numerous festival prizes, was selected for Sundance Film Forward, and is in the permanent collection at the Museum of Modern Art. Nahmias recently produced the Sundance award-winning Unrest directed by Jennifer Brea. Her producing credits also include the documentaries Afternoon of a Faun: Tanaquil LeClercq, Shield and Spear, and the fiction feature No Light and No Land Anywhere. She is currently directing Jesse Krimes, a documentary about an artist who clandestinely creates a remarkable large-scale mural while incarcerated for six years in U.S. federal prison. Deborah Hoffmann received an Academy Award nomination in 1995 for her documentary Complaints of a Dutiful Daughter and again for Long Night's Journey into Day in 2000. She was the executive producer of the 2016 Oscar-nominated short Extremis, and she is also a widely acclaimed editor of such classic documentaries as the Oscar-winning The Times of Harvey Milk, Ethnic Notions, and Color Adjustment. She has received two national Emmys, a Peabody, a DuPont-Columbia Award, and a Rockefeller Fellowship. Deborah was a lecturer at the UC Berkeley Graduate School of Journalism from 2000 through 2009, at which time she had to resign due to ME/CFS.